About The Company - How Mr. Timesaver Started - Meet Our Founders! 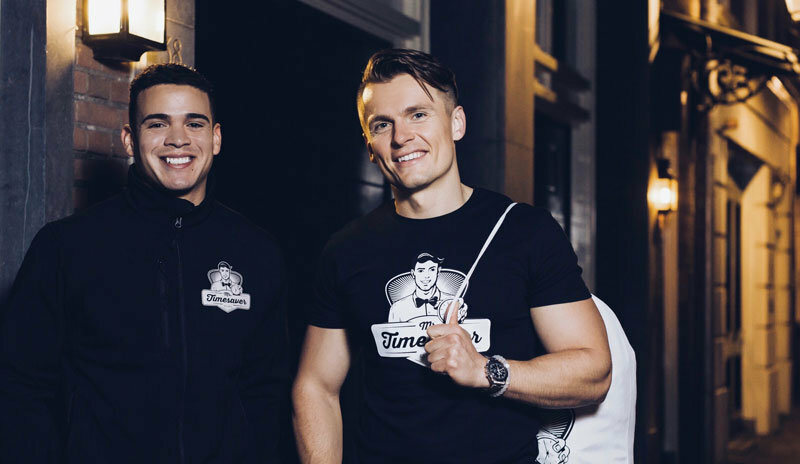 About The Company – How Mr. Timesaver Started – Meet Our Founders! Time is the one thing you can’t save for later. It passes by, or better said, it flies by. If you choose to use it wisely or not. Eventually you’ll be stuck saying “if only I had more time to ..” or “if I wasn’t always so busy I would have ..”. You can’t save time for later, but you can use the time you have better and more efficiently. Mr. Timesaver was created to fill the need for a more convenient, flexible, and sustainable solution to time-management. We do that by taking the most time-consuming chores off your to-do list. Dry cleaning, laundry, and clothing repair deliveries are only the beginning of our time-saving journey. Two internationals from the Rotterdam Business School, with a passion for service, created the business solution to their own personal problem. Since then, the business continues to grow, which of course comes to no surprise. Because, who doesn’t need and appreciate a little more Time? Aside from running the business, they also work on Mr. Timesaver’s further developments: in size by expanding into other service areas/cities and in depth by expanding the number of services offered. However, continuous improvement of the overall user experience, maintaining a high quality of service, and always having a friendly attitude towards customers and colleagues remains the top priority. Want to know more or work together? Contact them freely via email. All team members are cut from the same cloth: love of service, eye for detail, and customer centric attitude with a smile. That is what quality is made of, but most importantly: work is much more enjoyable. That’s how we like it. To provide greater convenience for our customers by being there where they need us, when they need us. We strive to deliver excellent customer experiences, with a flexible, warm, & friendly attitude, each and every time. From dry cleaner and laundromat to cobbler and tailor: in every city we serve, we only work with the best professionals. We know and inspect them personally – and we will continue to do so. That’s how you receive the consistent quality you deserve.